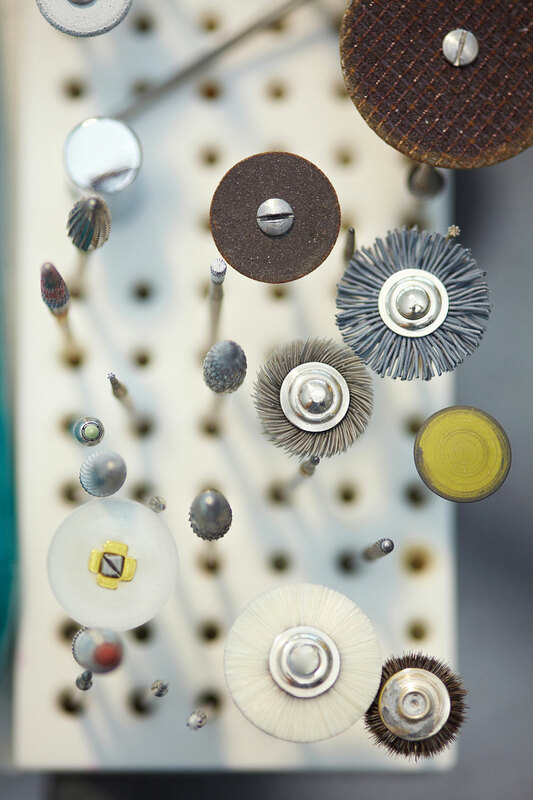 Rotary discs are used by dentists, dental lab workers, jewelers, and hobbyists. These discs have a wheel shape and are made with various materials, such as diamond grit, silicon carbide, high-grade corundum, or silicone for polishers. They are available as flexible, very flexible, or rigid discs. Other discs are called separating discs and cut-off wheels. Some discs have serrated edges; others, such as the polishing discs, are mounted and have a sharp edge. Rotary discs are generally produced to attach to a mandrel and are available in a variety of diameters. Rotary discs are configured as single or double sided - the grit is bonded to one or both sides. Diamond discs may have the grit bonded as safe inside discs or safe outside discs. A safe inside disc has diamond coating on the outside surface only; a safe outside disc has diamond coating on the inside surface only. Grits are available as follows: extra coarse, coarse, normal, fine, extra fine, or ultra fine. The selection of the disc is based on the task to be accomplished and what material is being worked with, whether it is natural enamel, acrylic, or metals such as gold and silver.